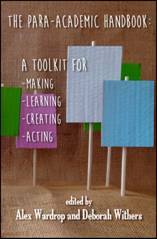 ‘Academia is dying, and in the process compulsively crushes the desires for learning, creating, teaching, cooperating it claimed to foster’, Isabelle Stengers writes as endorsement for The Para-Academic Handbook: A Toolkit for making-learning-creating-acting, a unique collection exploring the margins of contemporary academia. The book collects global perspectives of people who feel connected, in different ways, to the practice of para-academia. Those people who work alongside, beside, next to, and rub up against the proper location of the Academy, making the work of higher education a little more irregular and perverse. This event will discuss the perils, possibilities and necessities of para-academic practice. It will explore how alternatives to the marketised university can not only be sustained, but also flourish. Speakers include editors of the collection Deborah Withers and Alex Wardrop, and contributor Charlotte Cooper.